This magnificent and historic original measures 76 x 101 cm (30″ x 40″), oils, has been sold to Tracy Edwards. Tracy wrote to me: “The painting arrived safe and sound and it is as wonderful as I expected! It will be displayed at the RORC and then the National Maritime Museum“. 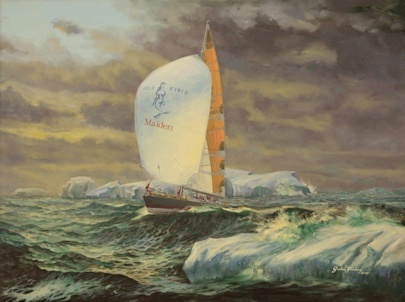 Tracy Edwards ordered a second major painting ‘Maiden Home‘ of her famous yacht, as a gift of appreciation for her major Sponsor. 2 remaining prints signed by the captain and artist as a numbered edition price £147.00 each including postage. Maiden was the first all-female crew to circumnavigate the globe. 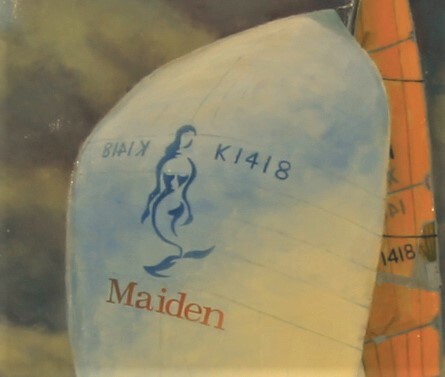 “Maiden” ~ Tracy Edwards and her team overcame numerous difficulties and set backs ashore and afloat, was sailed into history as the first all girl crew to complete a circumnavigation. A bonus, they won their class on two of the toughest legs; in the Southern Ocean. Determined not to let the opportunity pass, Tracy Edwards found a second hand boat, raising the money, even selling her home, rebuilt the yacht, found a sponsor (Royal Jordanian Airlines) for her boat and sailing her challenge, thanks in part to the Duchess of York, then raced with an admirable panache in the Whitbread Round the World Race. The yacht “ Maiden ” as captained by Tracy Edwards is shown here the day she first entered iceberg waters in deep in the Southern Ocean. Tracy Edwards has gone on the have an illustrious career and can be found via Linkedin. You could acquire or commission a painting of this quality. By mutual agreement payments can be in instalments.